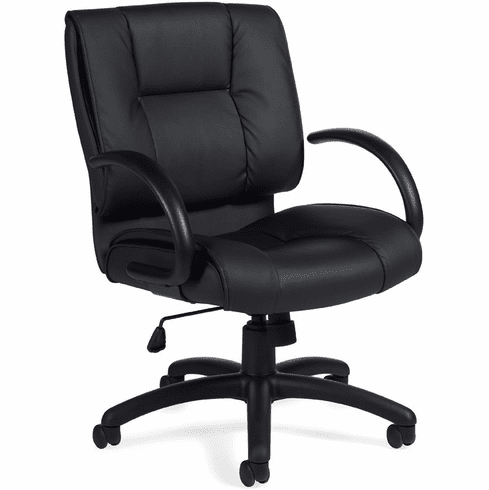 This mid back executive office chair from Offices To Go features eco-friendly Luxhide leather upholstery. Luxhide consists of bonded leather fibers for strength and durability with a soft faux leather surface area. Other features include thick, foam filled seat and backrest cushions, pneumatic seat height adjustment, 360 degree swivel, comfortable urethane "reverse curve" arms, tilt with tilt lock, tilt tension adjustment and a scuff resistant arched molded base with twin wheel carpet casters. This chair meets or exceeds ANSI/BIFMA standards. Matching leather guest chair also available. Dimensions: Back Size: 21"W x 22"H. Seat Size: 21"W x 18"D. Seat Height Adjustment: 16" - 20"H. Overall: 39"H x 27"W x 28"D. Five year limited warranty from Offices to Go. This chair normally ships within 1-2 business days.